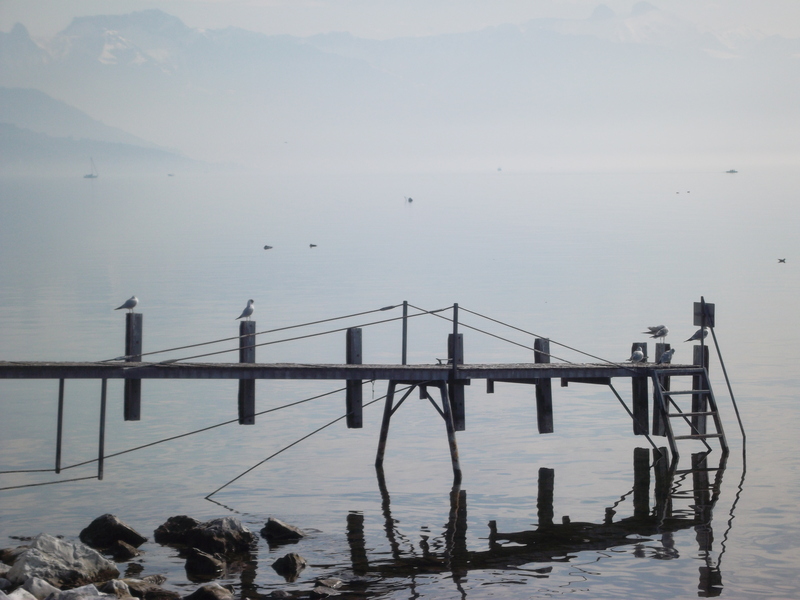 It was Vivian Moreau’s idea that I blog about our year in Switzerland. As a journalist with an entrepreneurial bend of mind, she suggested this would have the makings of a good travel book, which goes to show that I have hidden my aversion to travel from her quite well. Everyone is a better traveller than me. Everyone. I like seeing new places, but I hate what it takes to get there. Maybe in short and infrequent bursts, corporate travel is a happy novelty, but our experience over 30 years is that it quickly acquires the enchantment of a long-haul bus tour, which is to say, the bathrooms and sleeping arrangements are never as good as those at home. Still, it is an economical way to see the world, and we’ve done it repeatedly, so the good does outweigh the bad. If the beds, bathrooms and bureaucracies are the minuses on this crazy life; a front-row seat watching how foreign people live and how their countries work are the pluses. This is the last Hobonotes post, unless something faintly amusing occurs on our trip home tomorrow. For our friends and family reading this, see you soon. For strangers we picked up along the way, thank you for joining us and for your engaging feedback. * Also, I will not do truly adventurous things, like fling myself off a cliff, trusting my life to a thin sheet of fabric (parachuting, paragliding, parasailing, you name it, I won’t do it). 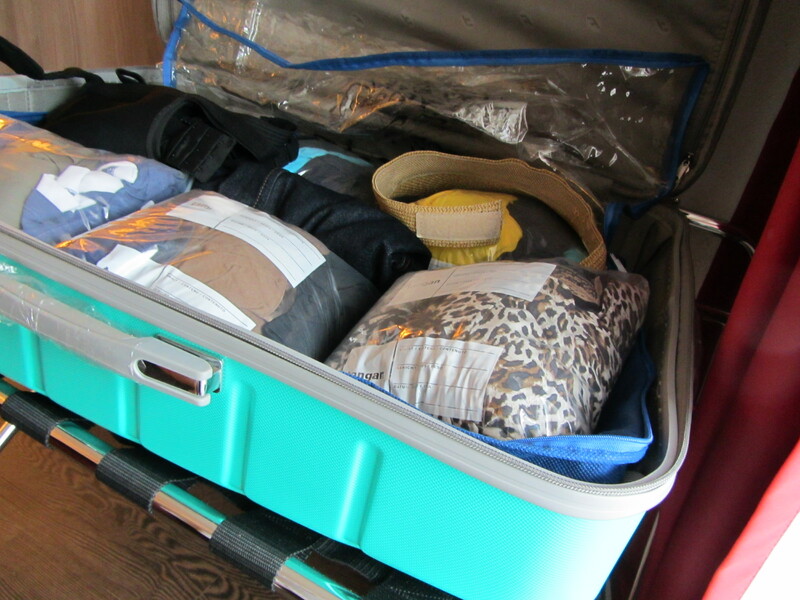 This is a travel blog for the timid. Soon after starting this blog, a former colleague demanded via email that I delete a humorous excerpt from an email he/she sent to me some years ago. I thought about replacing the excerpt with another email he/she wrote wherein he/she used some hostile terms that if reported to our Human Resources Department, would have obliged them to pull him/her through a meat grinder. I never ratted out my former colleague, and he/she is doing well professionally now. I like to think I had a hand in that. 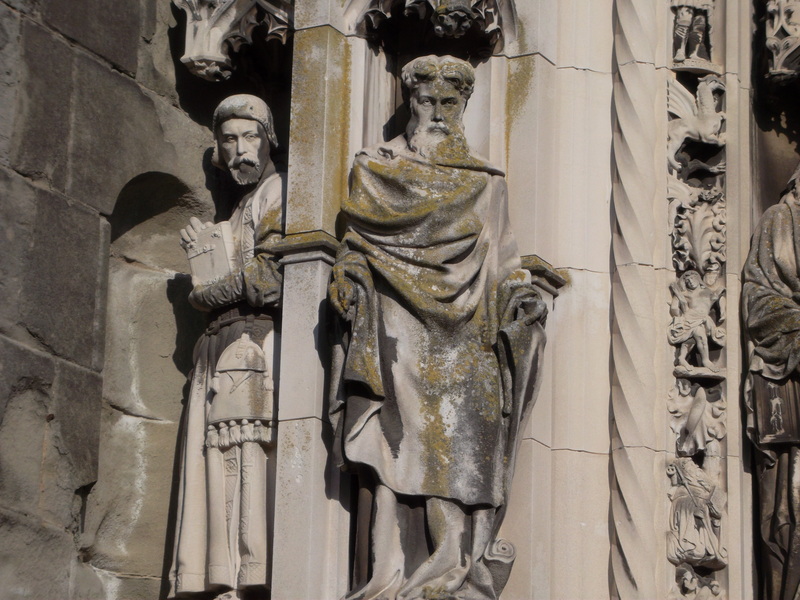 The humorous excerpt is still somewhere on this blog. The most hits this blog got in a single day was 885. It surprised me, too. It must have streamed into a commercial travel website somewhere in the U.S. (the source of about 845 of those hits). The all-time top post was the innocuous Luscious Lucerne. It surpassed the previous top post on Paris and kidneys, which led the pack until this month. Most hits came from the U.S., Canada and Switzerland. I had readers from every continent and almost every country, but not one hit came from Greenland. Don’t they ever travel? I didn’t do well with African readers either, although I did score a fringe of readers there. 91: Geneva: Get Up + Go, Or Not? 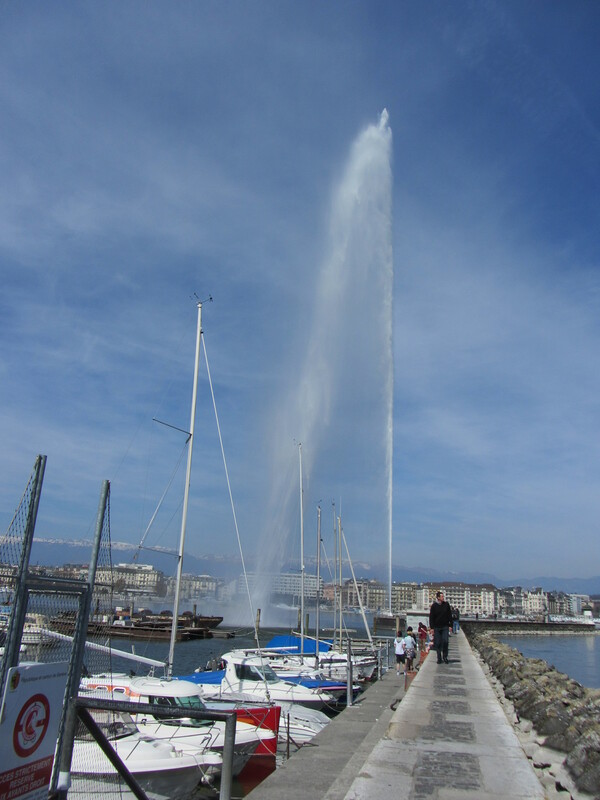 Wiki-excerpt on Geneva's fountain: Five hundred litres (132 gallons) of water per second are jetted to an altitude of 140 metres (459 feet) by two 500 kW pumps, operating at 2,400 V, consuming over one megawatt of electricity. 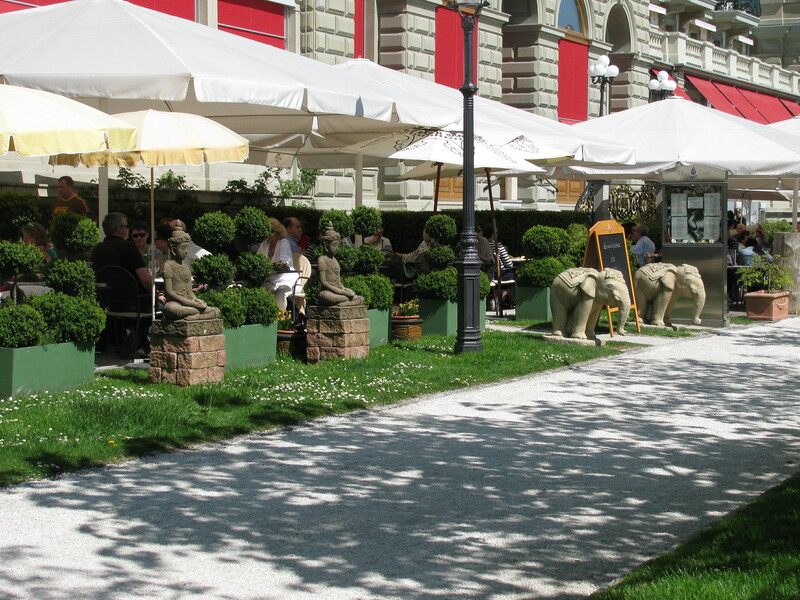 New York, London, Geneva – there are some city names that everyone knows, yet there is just one in this mini-list that travel-guru Rick Steves ignores altogether: Geneva. That fascinates us. After all, who doesn’t recognize the Geneva Convention, which undergirds international humanitarian law. I have even read the thing, not to better myself but just so I could get smarmy with a friend whose favorite phrase was “in violation of the Geneva Convention,” which it turned out he had not read, just as I suspected. Nevertheless, it is a fun weighty document to throw around in a debate, so I don’t really hold this against him. 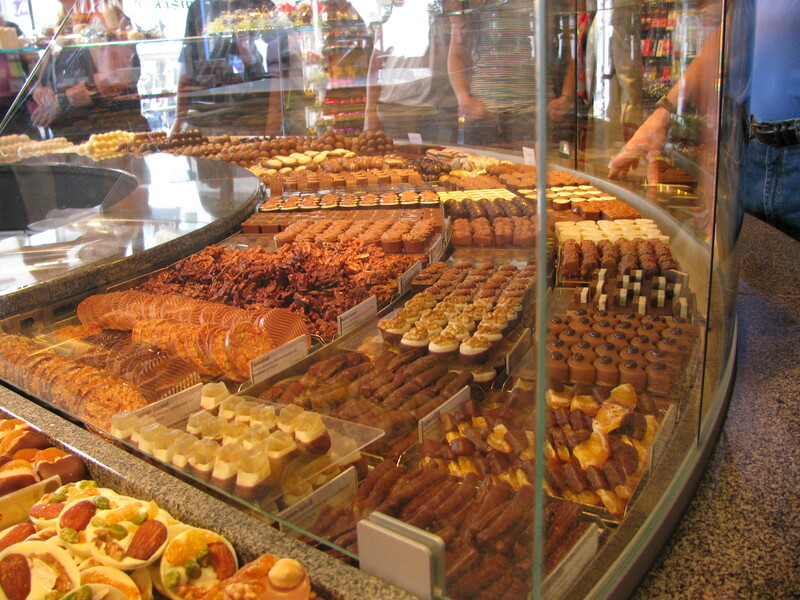 Geneva’s tourist bureau is pretty mad at Rick Steves for overlooking them, but they should think again. What do they have that would draw Rick Steves, who pares his travel advice down to typical North American vacation spans (“best in 22 days,” “best in 14 days”) and tourist mini-breaks of a few days? 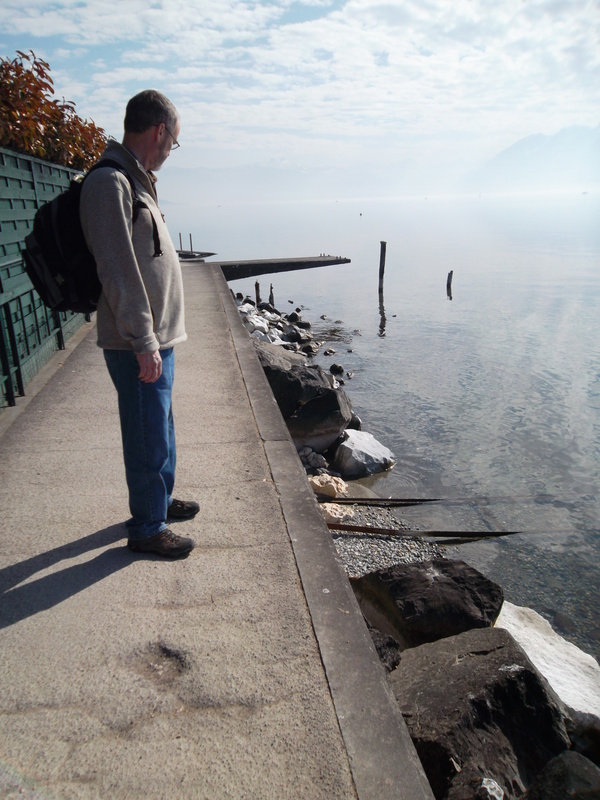 Rick Steves is not Geneva’s biggest problem. Bern, Lucerne and Zürich are, not to mention the dozen teensy Swiss villages that are so charming they easily beat out Geneva as a great day-stop (Thun, Neuchatel, Appenzell, Solothurn …). On paper, Geneva has it all: A lake, a river, a promenade, an old-town, a storied and gloried past and the French Alps for a backdrop. For the well-heeled, there is Cartier (as plentiful in Switzerland as Wal-Mart in America), Louis Vuitton and Chanel. 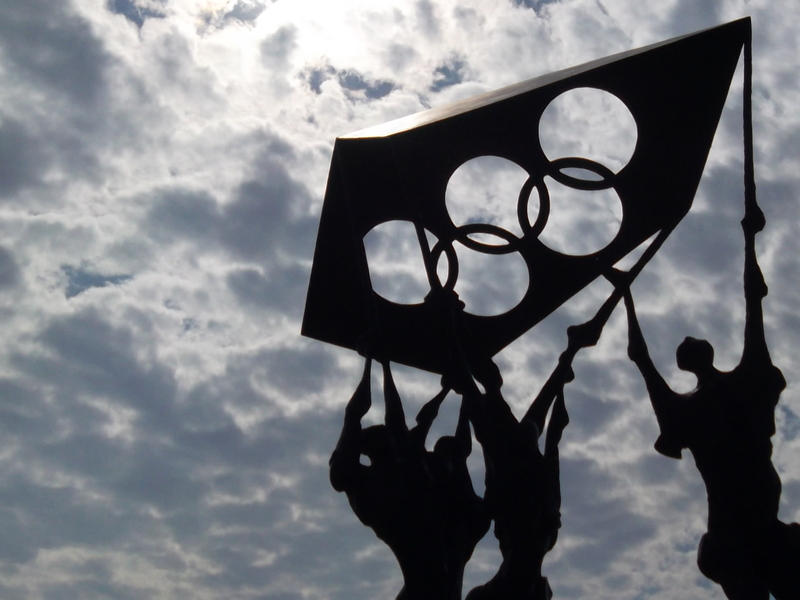 And yet, there is a problem, best symbolized with Geneva’s 110+ year-old fountain. 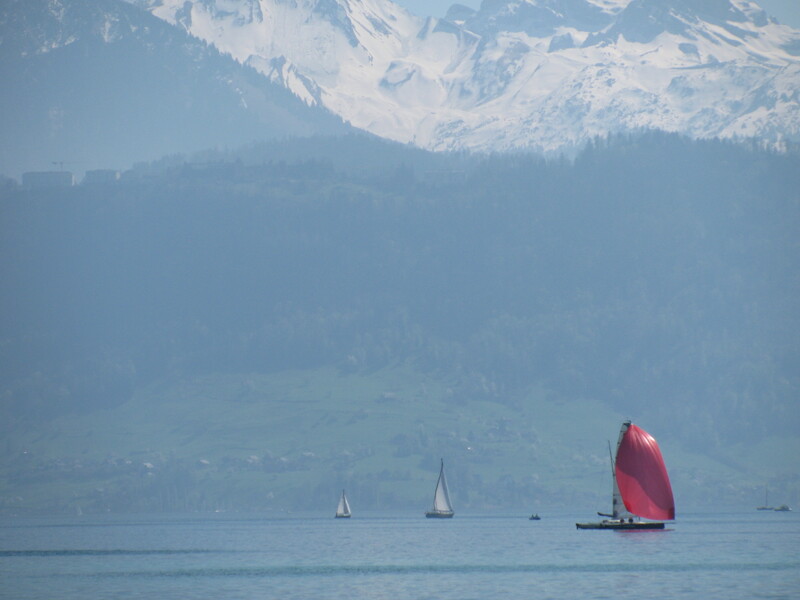 The thing is one straight spout jetting up from Lac Leman (also known as Lake Geneva). 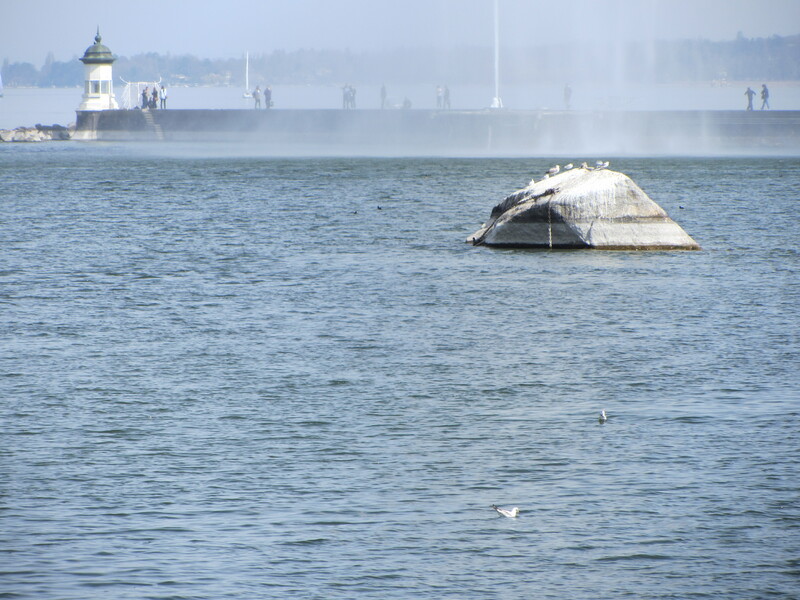 It sends five hundred litres (132 gallons) of water per second up to around 460 feet at 124 mph. This height leads to the boast that it is the tallest in the world. Geneva should be nervous about this: As soon as this claim comes to the attention of engineers in Dubai, they will build a 1,000-metre fountain. But to get back to Geneva: A plaque at the base of the stone jetty by which visitors can stroll out to the fountain jet explains that the water’s white appearance is due to a special nozzle that injects tiny air bubbles into the water. Would that be like the same nozzle hardware stores sell for $1.29 that can be fitted over kitchen taps? Seriously, Geneva, the city who gives the world the Red Cross, you can do better. If in over 100 years it has not occurred to you to do something else with your fountain besides inject air into it (Old Faithful does that without any special nozzle) and cast a light on it at night, then you need to convene a new committee to travel the world to see what else has been going on in fountain technology lately. San Diego’s Sea World would be a good starting place. This is one of two stones brought down by glaciers during the Ice Age. Known as Pierres du Niton (Neptune's Stones), this stone was once used as the reference point by which the Swiss measured altitude, says the writers of Eyewitness Travel: Switzerland. If that does not suit, they could also hire a grouchy old man to randomly point the spray at passersby – as unpleasant as that might be for tourists it would at least add an element of excitement and unpredictability to the site. The fountain says that Geneva thinks going big is enough, but it is not. There is, in fact, a sense of bigness in Geneva’s downtown, a sense that this is truly a working city with practical matters on its mind. That is not a bad thing, but the town leaders are goofy to then get snooty when a leading travel guru rightly identifies it as such and gives it a pass. But all this is not to say that Geneva is not worth the visit. 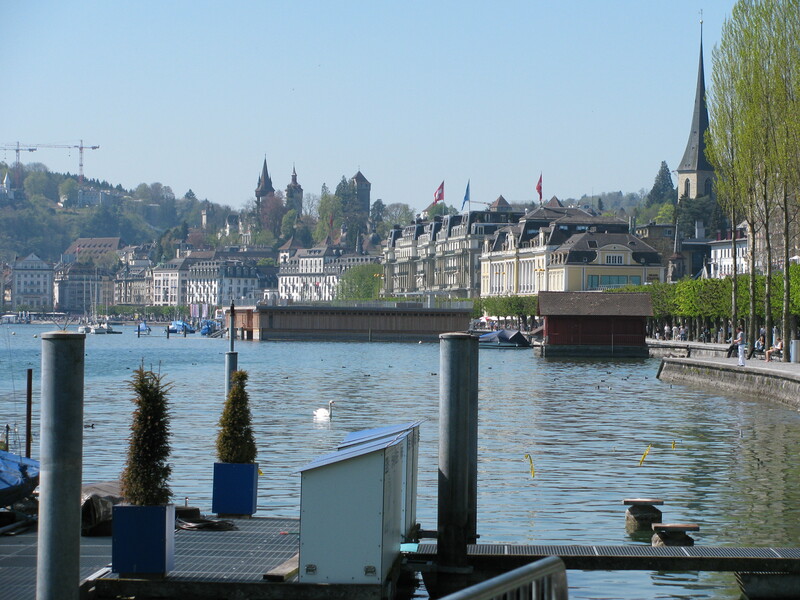 It is, provided you have already seen Lucerne, Zürich, Bern, Neuchatel, Thun and Solothurn. 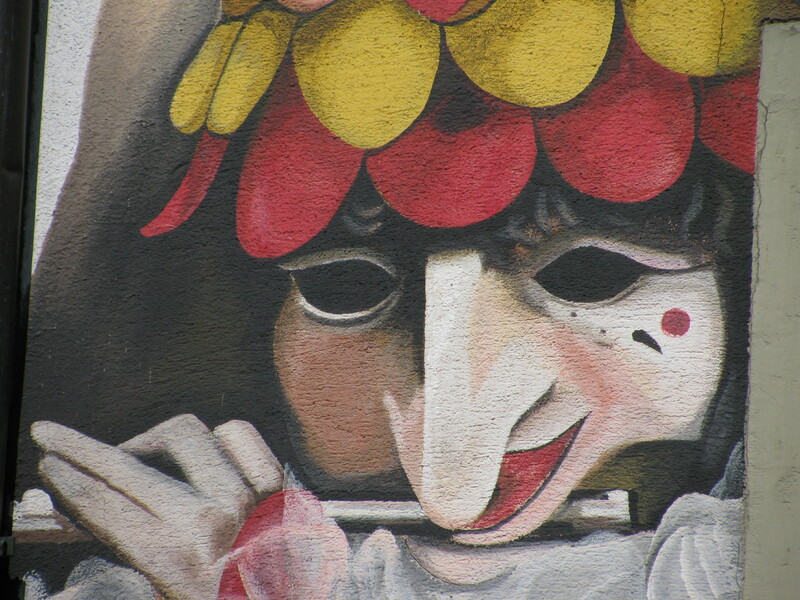 Tomorrow: More on Geneva and what to see/do there. Saturday we took the 90-minute train ride east to Lucerne, past lush, meticulously kept pastures, rolling hills, quaint farms with cows lolling about, a trip made sweeter because we now have our Swiss Rail resident half-price cards. It looks like a great deal, bringing the price for two return tickets down to $78. We were pretty pleased with that until we realized that we were travelling only 48 miles – what the heck? That’s like a $1.50 a mile. Swiss comedians? Or the Swiss version of a chain gang (ie. not breaking rocks, just colouring on them). We arrived in Lucerne to discover the city in the throes of an international comedy festival called “Fumetto” – at least, that was the explanation we got for the men in orange suits studiously scratching a chalk path into one of the cobblestone squares, which didn’t look funny at all, but I’m sure something hilarious was about to happen. 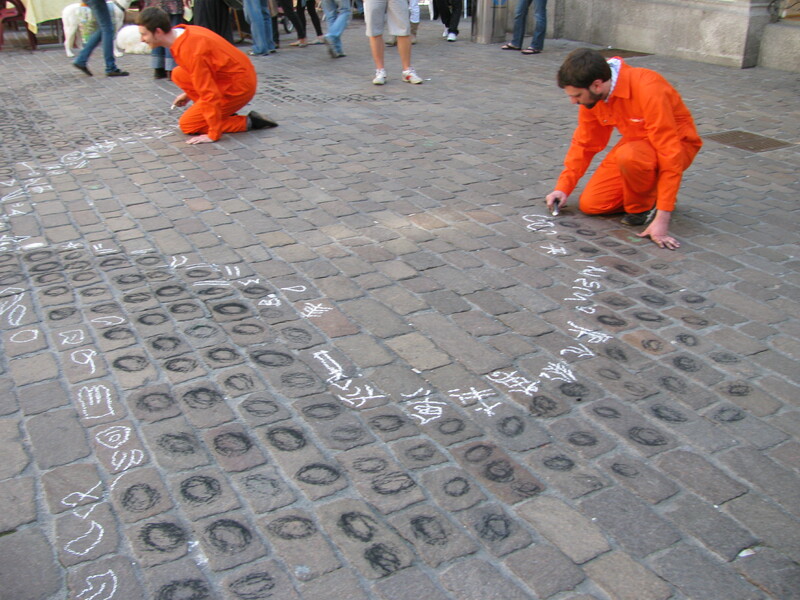 We had our doubts, because orange suits are prison gear back in the U.S., so we were suspicious this was the Swiss version of a prison-work program. We checked out a kitchen store where laundry bags sold for $99 and shoe stores, at one of which I found a pair of loafers priced at $269… others were priced higher, but my brain could not compute such numbers well enough to recall them now. 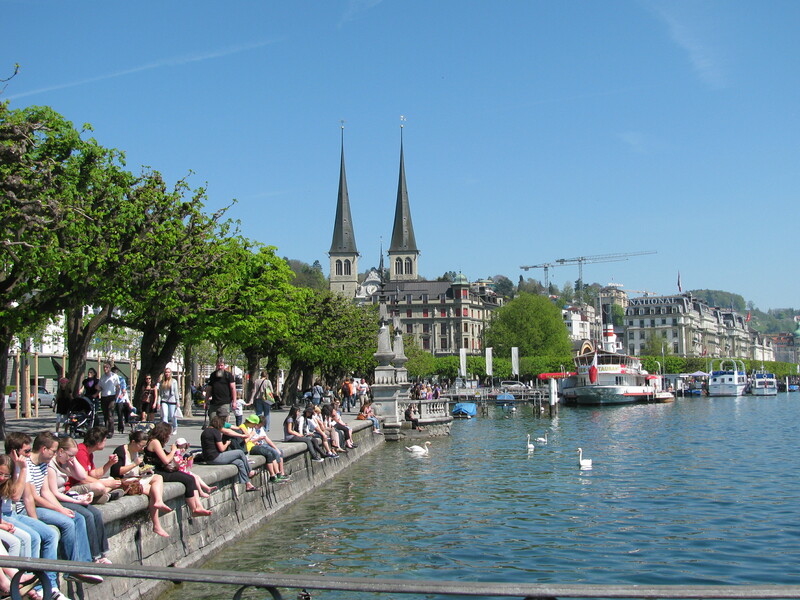 Lucerne is, after all, Switzerland’s Monaco, and the well-heeled were in ostentatious abundance from stylish couples strolling the lakeside promenade to high-end sports cars inching through narrow cobblestone streets that until their arrival, we thought were pedestrian-only. Maybe the rules are different for those driving Bugattis and Lamborghinis. Even the McDonalds restaurant was high-end with vintage ceiling tiles, orange cube leather seating and a McCafe pastry bar. Ooo la la! It was a beautiful city. I’ll let the photos speak for it. Click on photos to get a larger version. At a swank chocolate shop called Merkor - I think it translates into "No chocolate under $40"
About half of the chocolate in Merkor's main showcase, and I do mean "showcase." The word "display" just doesn't quite make it. Lucerne's waterfront. Not so bad. 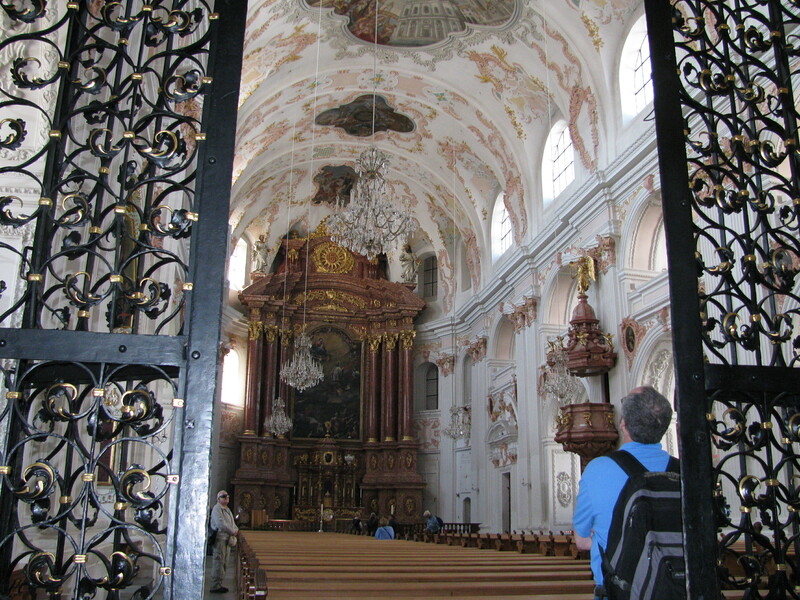 The inside of Lucerne's Jesuit Church. Very white. Very bright. Lunch for the uber-rich - also, where they are on display for gawkers like us. 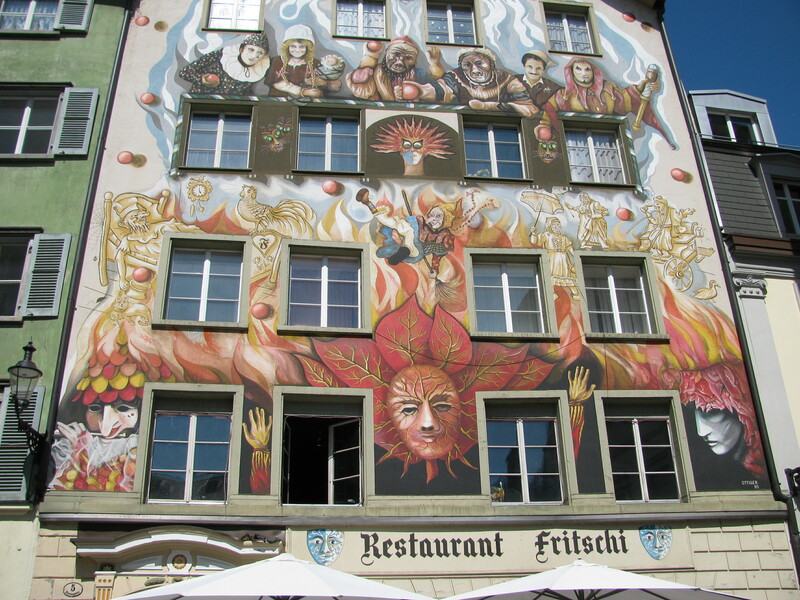 Many of Lucerne's Old Town buildings sport frescos (murals) - this one depicts the city's Mardi Gras celebrations. 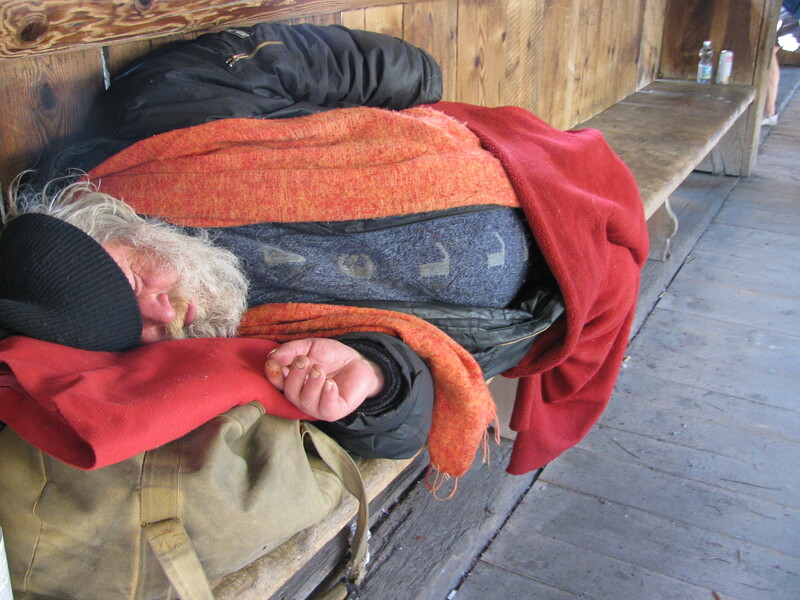 Lucerne has two homeless men. We found them both. It's noteworthy that this man's wardrobe included a colour (red/orange pepper) that matched many park benches, and that is also favored among the rich (see other photos). 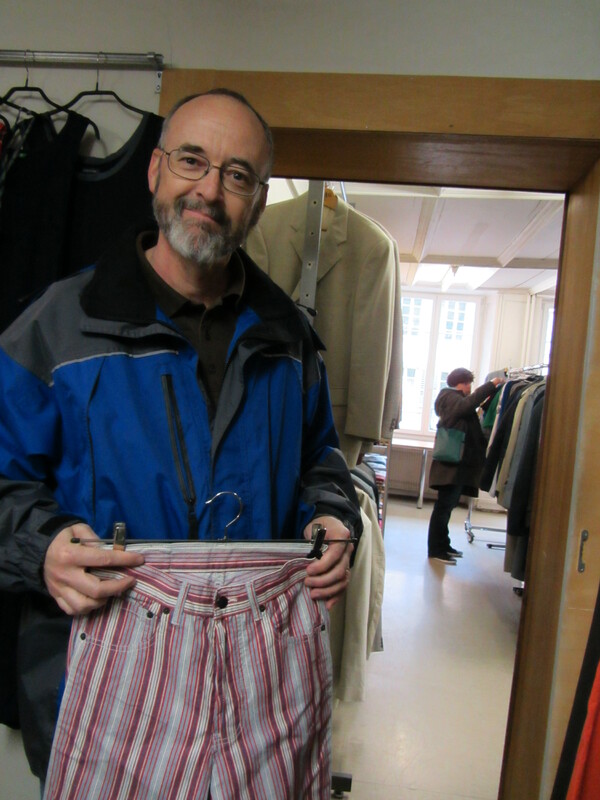 Even Lucerne's homeless fall under the dictates of fashion. 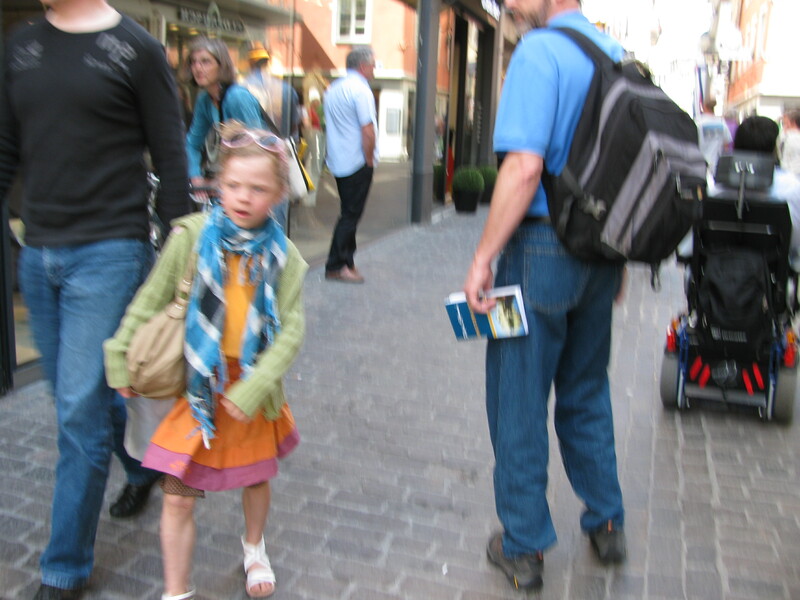 The photo quality is not very good, but this stylish 8-10-year-old girl's pic is worth posting - we saw fashion-conscious kiddies everywhere. What is this? France? A woman parading her control over her husband on Lucerne's Promenade - his attire matches hers right down to his shoes. Somebody help this guy. View over Lucerne Lake with the Alps in the background. This body of water is also called Vierwaldstattersee. Yes, it is.